Colon cancer or colorectal cancer is the third most common cancer. There are more than 95,000 new cases each year in the United States. As with most cancers, the key to beating colorectal cancer is catching it early. Now is a great time to talk to your doctor if you have concerns about your colon health. Changes in bowel habits that last longer than four weeks. This could include diarrhea or constipation. Often there are no symptoms of colon cancer in the early stages. Symptoms can often vary, depending on the stage of disease, the cancer’s location and the size of the cancer in your large intestine. If you notice any possible symptoms of colon cancer, such as blood in your stool or a persistent change in bowel habits, it is time to talk to your doctor. If you have a family history of colon cancer, you may want to have an early screening for colon cancer. It is generally recommended for those without a family history of cancer to start screenings at age 45. This is a new recommendation. Depending on your health and your family history, your doctor may recommend more frequent or earlier screenings. All African Americans should start colon cancer screenings at age 45. In most cases, it's not clear what causes colon cancer. When healthy cells in the large intestine or colon start growing too quickly or dividing too often, cancer can develop. As the cells accumulate, they form a tumor. Over time, cancer cells invade healthy cells and cause the cancer to spread to normal tissue nearby. Cancerous cells can also travel to other areas of the body, causing additional cancer. In some cases, doctors can pinpoint inherited gene mutations that increase the risk of colon cancer. These mutations are often passed through families. However, in the case of colon cancer, these genes have only been linked to a small percentage of colon cancers. While inherited gene mutations do not make cancer inevitable, they do increase a person’s likelihood of developing cancer. Low Vitamin D3 levels have been associated with an increased risk of colon and rectal cancers. Doctors have found a strong connection between diet and cancer. Studies have shown that the typical Western diet increases the risk of cancers, including colon cancer. This high-fat, low-fiber diet, typical in the United States, significantly increases cancer risk. It is not entirely clear why this way of eating causes higher cancer risk, but it appears there is a connection between a lack of fiber and the health of the colon. Research is continuing to determine the overall cause of colon cancer. There are many risk factors for colon cancer; some that can’t be changed, such as family history, and others than can be changed, such as dietary adjustments. A personal history of colorectal cancer or polyps. If you've already had colon cancer or adenomatous polyps, you have a greater risk of colon cancer in the future. Family history of colon cancer. You're more likely to develop colon cancer if you have a parent, sibling or child with the disease. If more than one family member has colon cancer or rectal cancer, your risk is even greater. Diabetes. People with diabetes and insulin resistance may have an increased risk of colon cancer. Lifestyle and diet changes can improve the health of those living with diabetes. Low-fiber, high-fat diet. Colon cancer and rectal cancer may be associated with a diet low in fiber and high in fat and calories. Research in this area has had mixed results. Some studies have found an increased risk of colon cancer in people who eat diets high in red meat and processed meat. A sedentary lifestyle. If you're inactive, you're more likely to develop colon cancer. Getting regular physical activity may reduce your risk of colon cancer. There are ways to reduce your risk and possibly prevent colon cancer including getting a regular colonoscopy as recommended by your physician, taking a low-dose aspirin, or taking a Vitamin D3 supplement. Talk to your physician before starting a new low-dose aspirin or supplement regimen. 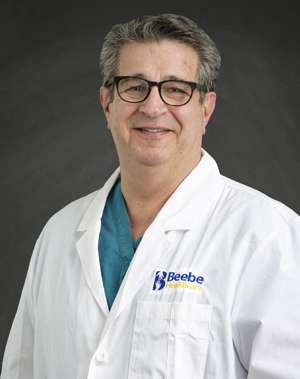 Harry Anagnostakos, DO, is a gastroenterologist with Beebe Gastroenterology Associates in Lewes. He earned his medical degree from the Philadelphia College of Osteopathic Medicine. Dr. Anagnostakos has 30 years of experience in private practice and has performed more than 20,000 endoscopic procedures. For more information about Beebe Healthcare, go to www.beebehealthcare.org.